Friends of the Chicago River’s goal to remove the dam at River Park began in 2000, an effort aimed at removing an insurmountable barrier to fish and other wildlife, improving the overall ecology of the waterway and returning the site to its natural beauty. 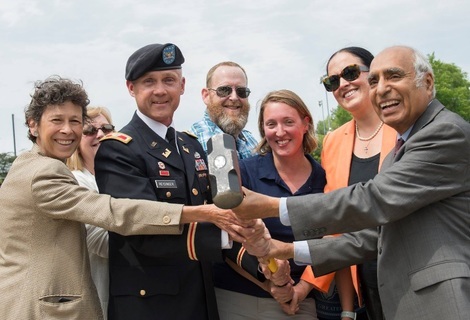 On July 31, 2018, Friends joined with government officials at the North Side park to mark the demolition of the concrete wall. The dam and other concrete will be removed and replaced by riffles, step pools, cobbles and other gravels and sands. The project also calls for the restoration of 14 acres of riverbank and five acres of aquatic beds by removing invasive species and planting native vegetation. 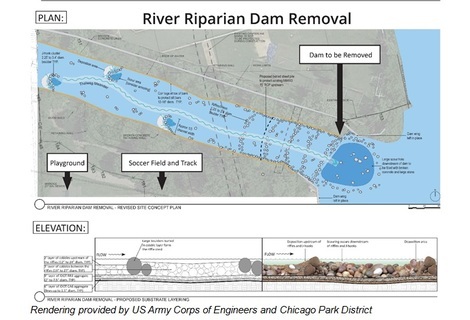 Friends has advocated for four Chicago River system dams to be removed to reconnect an additional 55 miles and provide enormous environmental benefit. The North Branch Dam is the second of the four to be removed. The dam was built at the confluence of the North Branch of the Chicago River and the North Shore Channel in 1910 by what is now known as the Metropolitan Water Reclamation District. Built shortly as part of the construction of the North Shore Channel after the Chicago River was reversed, the dam’s purpose was to preserve the North Branch by controlling erosion and flooding. The channel was constructed to drain marshy areas north of the city and add Lake Michigan water to dilute pollution in the waterway. The dam was modified in the 1920s and again in the 1960s. In 2006, Friends issued an influential study on the effects of the dam. The North Branch Dam Fish Passage Alternatives Assessment Report by Montgomery Watson Harza looked at fish habitat and river hydraulics and concluded that that the dam was a barrier to fish populations in the North Branch and that removal would benefit aquatic wildlife. Many of the findings from that study were incorporated in a major, 2016 U.S.Army Corps of Engineers environmental assessment of the waterway, River Riparian Connectivity & Habitat. In the early 2000s, Friends’ lobbying of Illinois Gov. Patrick Quinn helped win support for dam removal projects. By replacing the dam with a series of riffle pools, the North Branch will stream over rocks. Instead of a single four-foot drop at the dam, the restoration project will result in smaller drops that allow fish a better chance to swim upstream. The number of fish species found in the Chicago River system has drastically increased since the 1970s when monitoring of the fish population first began. From 10 known species in 1974, MWRD aquatic biologists have documented 76 total species, including 59 that have been found in the CAWS since 2000. But fish surveys have also documented less biodiversity north of the dam so the Illinois Department of Natural Resources and Friends of the Chicago River encouraged improving access and stabilizing the streambanks. Removing the dam will also improve recreational opportunities: under normal conditions paddlers will no longer will need to portage their canoes and kayaks around the area. Esthetically, removing tons of concrete will beautify the area, returning its natural appearance, said Frisbie. The ceremony marking the beginning of the demolition of the dam included representatives from the U.S. Army Corps of Engineers, the MWRD, the Chicago Park District and John Quail, director of watershed planning for Friends of the Chicago River. "This is a very exciting project for Friends. We started working on this project in the year 2000 with a grant from the Grand Victoria Foundation to do a feasibility study to look at how we could move people downstream here in a safe way and how we could move fish upstream." He said the work at River Park is part of "undamming America." "When we first started looking at this we looked at dams on the west coast and fish ladders and we determined that our midwest fish are not nearly as athletic as they are in the mountains. So we had to come up with some really good solutions," Quail said. Quail recalled meeting with MWRD engineer Joe Schuessler in 2001 about working with the district to remove the dam. That removal, he said, will allow fish to move more freely, including nearly 300,000 catfish Friends has released with the Illinois Department of Natural Resources. "This dam removal is going to build on decades of investment in the ecology of the Chicago River," said Quail. "This is really an exciting day for the river, the fish in the river and the recreators of the river."